Around midnight on June 17, 1979, Air New England Flight 248, en route from New York, crashed into the woods on Cape Cod. The pilot was killed, and the survivors struggled to escape the wreckage and wait for rescue. They survived with trauma both physical and emotional. Robert Sabbag was among them. 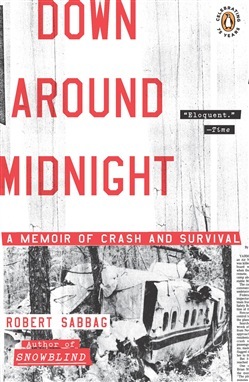 This is his gripping account of the crash and his candid attempts, and those of the other survivors, to come to terms with its aftermath. Fast paced and mesmerizing, it is an unforgettable personal reflection on how we live with what we can never forget. Acquista Down Around Midnight in Epub: dopo aver letto l’ebook Down Around Midnight di Robert Sabbag ti invitiamo a lasciarci una Recensione qui sotto: sarà utile agli utenti che non abbiano ancora letto questo libro e che vogliano avere delle opinioni altrui. L’opinione su di un libro è molto soggettiva e per questo leggere eventuali recensioni negative non ci dovrà frenare dall’acquisto, anzi dovrà spingerci ad acquistare il libro in fretta per poter dire la nostra ed eventualmente smentire quanto commentato da altri, contribuendo ad arricchire più possibile i commenti e dare sempre più spunti di confronto al pubblico online.